And of course the "my wife is my rock" tears. For me, when he left, I was in shock, but coming after the much more painful "new hurts" of Albert Belle and Manny Ramirez leaving, it just didn't have the same stomach punch feeling. I think I may be in the minority, especially among fans who were really old enough to appreciate the mid-90s, and therefore feel truly betrayed. Of course, 600 is as close to a lock for Cooperstown as you can get. Thome has been one of the strongest hitters in baseball for a long time, and voters know that. He's never been the best player in the league, with a shocking low 5 All-Star games, one Silver Slugger, and one top-5 MVP finish. And the era that Thome is in automatically garners a second glance. In fairness, while few and far between, there have been quiet (and unfounded) whispers.) On Sportscenter Monday night, they alluded to the scourge of performance enhancing drugs in Thome's era, and how almost nobody can be without suspicion. (*required to say "besides Derek Jeter and Ken Griffey Junior.) Tim Kurkjian, on the other hand, dismissed such talk out of hand, in print and on television. "From all indications, Thome hit his 600 cleanly" and "without controversy" he opined on ESPN Monday night. He averaged over 45 homers a year from 2000 to 2004, behind only Barry Bonds, Sammy Sosa, and Alex Rodriguez. Somehow to Kurkjian, that is an argument that Thome is 100% innocent. 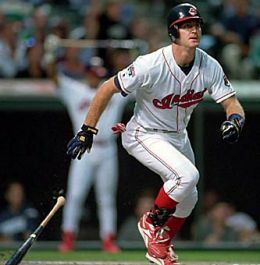 I have to admit--I hope Jim Thome never took PEDs. And there has been no proof or credible charge that he has. Besides leaving the Indians as a free agent, he seems like a great guy, a clean player that baseball could use more of. But common sense would indicate some reasons for skepticism on the PED front. I have a great autographed picture from 1993 or 1994 of Jim Thome. Dude is maybe 180 lbs. Now he's listed at 250 and is more like 270. His head has grown like the rest of his body over the past 18 years. Some of the body growth can be expected for a guy with his frame, sure, but this isn't in a vacuum. His home run totals jumped to Brady Anderson-esque numbers at about the same time as Sosa and Bonds. And while never a great third basemen, he became so bulky he had to move to first (and of course, later to DH.) I hope there are still guys out there who were clean. Especially guys who were on the 90s Indians. But that dream probably went out the window with Manny Ramirez, and let's just look at Jim Thome the same way we have to look at all players of his era. On the other hand, he's never tested positive, that we know of. This is the very defnition of "guilt by association." He has put up good numbers when testing has been in place, with four different teams over nine years. (See, should have stayed in Cleveland. My feelings aren't completely healed.) But let's not pretend there's not a chance. As Bill Simmon's called it recently (when referencing Nolan Ryan), it's America's new favorite game, "I wonder if they were cheating."